Combo meals are the combination of two or three things. It is a general perception that combo meals are only served in the fast food joints and are always junk food. That's not true- the combos we are going to make here are not at all junk food. These combos are made with clean and healthy ingredients and are very delicious. These combos are balanced and complete meals. They have combination of protein, vitamins, fibres, minerals etc. They have a curry preparation/veggie with kind of bread(homemade or ready made)/ Rice . 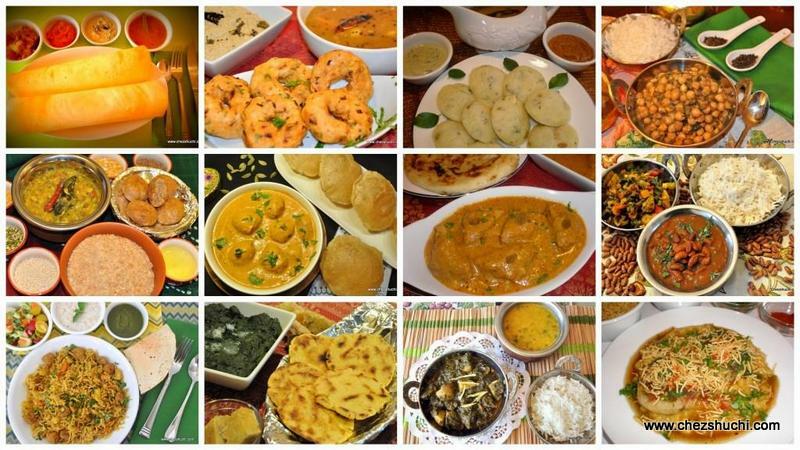 Some of these combo meals are served as snacks in India but you can serve them as a whole meal also. A desi drink can also be served with these combos in order to make a complete meal. Try out these combos and please do share your valuable pcomments. This is a very popular dish from West India - from Mumbai. Ragda is made with white peas (saphed matar) and seasoned with mustard seeds while the same white matar seasoned with cumin seeds called as matara in North. This is a yummy chaat , served with Potato patties and chutneys.. This is a combo from South of India. Idli Sambhar is usually served for breakfast or as a snack. This is my favorite combo and again I prefer to serve it as a complete meal. This is a very delicious , nutritious, and complete meal, as it has lentils, vegetables, semolina (made out of wheat), yogurt, coconut etc. ..
Kadhi Chawal is a lunch combo from North of India. About 40 kms away from Nainital, there is a small and quaint town, Naukuchiyatal- this dish is served in every big or small hotel in Naukauchiyatal. Kadhi is also served during festivals, and variations of Kadhi..
Palak Aloo is an easy way to add more greens to your daily diet. Palak is a Hindi word for spinach. Spinach has a high nutritional value and is extremely rich in antioxidants, folic acid, and vitamins. palak aloo and rice makes a perfect combo. You can also serve palak aloo with your favorite Indian bread. Arhar Dal is also called as toor dal or pigeon pea. It is yellow in colour and the most common dal all over India. In North Indian cuisine arhar dal is made almost every other day. Arhar dal is flavored with spices and served with roti and rice.